Sambucol® with natural black elderberry is trusted by millions of people worldwide. 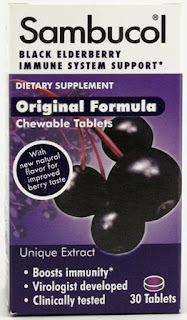 It is the original black elderberry dietary supplement developed by a virologist and researched and tested in published clinical trials showing it to help support the immune system. Sambucol® black elderberry extract is recommended by numerous nationally-recognized health experts, including Andrew Weil, M.D., in his popular book, Natural Health, Natural Medicine (Houghton Mifflin, 1995), to be taken if you get the flu. The brand is unique in that it is the only black elderberry extract used in published clinical trials and is manufactured using a proprietary method of extraction: Sambucol’s unique formulation and extraction process preserves and maximizes the naturally-occurring health benefits of the berry. A potent antioxidant, black elderberries have been used to traditionally combat illness since ancient times and have twice the natural antioxidant capacity of blueberries and almost twice that of cranberries. 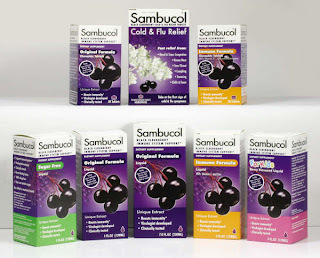 Sambucol® products are made from a unique extract of black elderberry, a centuries-old herbal remedy, now recognized as one of nature’s richest sources of anthocyanins, a class of flavonoids that are believed to help stimulate the body’s immune response. Sambucol® can be taken every day to help support the immune system. • Sambucol® Cold & Flu Relief Tablets-- NEW!! The Sambucol® line of products is available nationwide at major retailers, including health food stores including Vitamin Shoppe, pharmacy chains, including Rite Aid, Walgreens and CVS, independent drug stores, and online at drugstore.com. Go to www.sambucol.com for complete store availability. We were sent some Sambucol® to try out. Even though we were all actually sick in my household when it came, it really could have come in handy a couple of weeks prior to that! But, since we've gotten it, we all have been taking it, and so far, no one has gotten sick again! I love the flavor of the Sambucol® tablets also! Would you like to win some Sambucol®? Sambucol® For Kids 2yrs-12yrs. - $14.99 for 4 ounce bottle. All you have to do is fill out the form to be entered. Remember to visit Everyday Baby Steps and Moody Mama Says for one extra entry each!